Getting apple wood that is aged at least 6 months in your smoker is the key to making this recipe to perfection. Like most other fruit woods, apple has a light smoky flavor that provides a perfect balance with the combination of light and healthy chicken meat. As opposed to meats that contain more fat like pork or brisket that go better with darker and denser smoker woods. This recipe calls for smoking chicken breasts as they are the most popular cut and have a shorter cooking time of 2 to 2 1/2 hours, as opposed to a whole bird that can take up to 5-6 hours. Although we recommend using chicken breasts instead of a whole chicken, it is merely to cut down on the overall smoking time. Feel free to use a whole chicken with the recipe if you desire. Mix all of your ingredients minus the Apple wood in a large mixing bowl. Place your chicken breasts in the mixing bowl or a large gallon Zip-lock bag and let them marinade for at least 12 hours or as long as 32. If you have smaller wood chips instead of larger chunks, start by soaking them in water for a couple hours to absorb moisture and last longer. You can also use a smoker box that will keep the flame from directly burning your chips quickly. Next, light your smoker and let it warm to a temperature of 225-235 degrees. 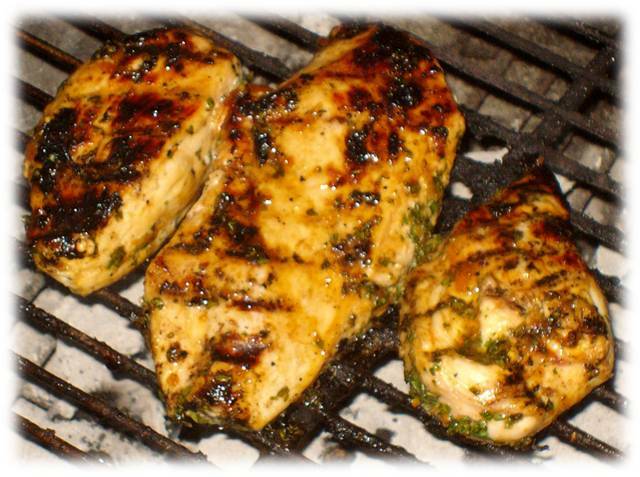 Place the chicken breasts on your smoker and shut your grill lid. Make sure your vents are at least a quarter of the way open to allow for air to circulate and draw the smoke across your meat. If your smoker is getting too hot, you can always close the vents a little to cut down on the air and the heat. Cook for an hour and 15 minutes. Check your smoked chicken breasts to make sure the temperature is still holding at about 250 degrees. Flip the chicken breasts and close the lid again. After 30 minutes to an hour, check the internal temperature of the chicken with a meat thermometer. You are looking for a temperature of 160 degrees before you can pull them off the smoker. If you want to get really creative, serve with an Apple salad or slices.